In September 2008 after bankruptcy of Lehman the financial industry as a whole nearly collapsed. Subsequent contraction of international trade was tangible proof for the serious threat Lehman posed to the stability of the system. Ben Bernanke putting the proverbial gun to Ken Lewis head while trying to rescue another Wall Street titan, Merrill Lynch, broke the law but might as well have saved international commerce and the world from the brink of disaster. A government report from the congressional oversight panel (COP) on troubled assets from financial institutions concludes that banks’ balance sheets are still clogged with possible future losses from hundreds of billions of impaired assets (also….). In the report’s data something else is being revealed too, with respect to Bank of America’s acquisition of former investment bank Merrill Lynch. After the merger with Merril BofA’s most toxic level 3 assets jumped 127 percent to $126.9 billion in the first quarter of 2009. 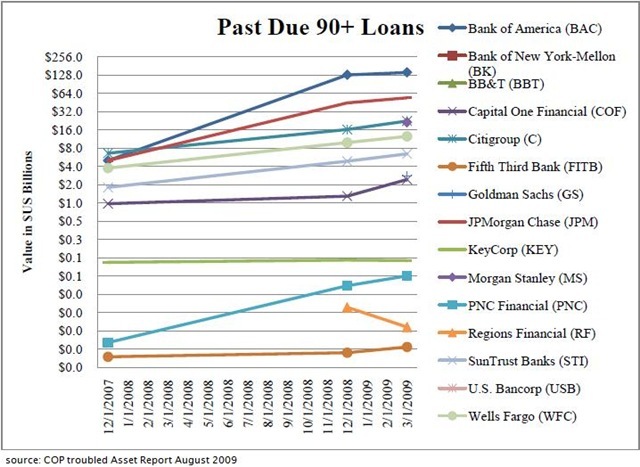 Loan quality in the form of 90+ day past due loans ballooned from $5 billion at the end of 2007 to $141.7 billion as of March 31, 2009. BofA’s credit derivative exposure to sub-investment grade assets experienced a significant uptick from little more than $500 billion to about $1.65 trillion over the last 15 months. Under these conditions Lewis’s reluctance to close the deal is understandable, so is Bernanke’s assertiveness on this issue. The following diagrams reveal survival of the financial system and the well being of international commerce might have been at stake in those crucial days of late 2008. It seems that BofA will chew on this piece of financial crap from Merrill’s almost bankruptcy for years to come. All the while executives at the firm and elsewhere are starting to rejoice again on better than feared earnings for the most recent quarter and reward themselves with another round of lavish bonuses. Wall Street star analyst Richard Bove in a note to investors cut short any hopes for a sustainable recovery in financials claiming bank earnings won’t improve in the third or even the fourth quarter. Goldman Sachs Group has tripled their growth forecast for the second half of this year. Inflation adjusted economic growth is supposed to jump to 3 percent annual rate. Yet even the mega bulls at GS do not think this growth spurt is sustainable, and anticipate a decline to 1.5 percent in late 2010. Will the American consumer be able to return and then keep up with lavish spending habits? This is the 64 thousand dollar question. In the past US consumer spending powered both the US economy and the rest of the world. After the crisis there still exists a possibility of painful adjustments to household and corporate balance sheets mainly in debt fueled economies. Indebtedness of US private households peaked at 132% of disposable income at the end of 2007. This ratio had fallen to 124% at the end of March, 2009, but is still too high. As a reaction US consumers are spending less and saving more in recent months. As people continue to struggle to repay their debt the savings rate is expected to gradually return to a range of 7% to 10%. There are also those who disagree and are not convinced that higher savings will ipso facto result in lower output. Michael Darda, chief economist at brokerage firm MKM Partners, anticipates a strong recovery in stocks and the economy. Obviously an increased savings rate is only a temporary phenomenon according to Darda. Even if Darda is right and we will return to old habits, can we be sure this is really what we want? A return to a debt fueled economy got us into trouble in the first place. These are rather conflicting interests between corporate and business protégés and basically everybody else. The leader of the pack on Wall Street is investment firm turned bank-holding company, Goldman Sachs. Yesterday GS released its consolidated financial statement for the second quarter of 2009. On first impression we see a great quarter and a reoccurrence of the firm’s unmatched earning power. Taking a closer look reveals quite a different picture. The 10-Q statement for the second quarter tanked GS stock by 2.01% yesterday, down $8.65 since August 6, 2009. GS 10-Q unaudited condensed consolidated financial statement makes certain estimates and assumptions. Most important are fair value measurements and accounting for goodwill and intangible assets. Actual results could be materially different from these estimates. The firm’s assets and liabilities are generally separated into two categories, cash instruments and derivative contracts. In determining their fair value, hierarchy levels two and three are significant because of the use of judgment and estimate for price transparency. Government agency securities, certain mortgage products, and certain money market securities are considered to be level two, if not actively traded. Cash instruments are considered to be level 3 if they are infrequently traded and lack price transparency. Such instruments include private equity and real estate fund investments, collateralized debt obligations (CDOs), less liquid mortgage whole loans and securitization products (backed by either commercial or residential real estate), and acquired portfolios of distressed loans. Over the counter (OTC) traded derivatives contracts are always valued as level three, and therefore subject to least price transparency. In such cases the transaction price is often used as the best estimate of fair value. In addition the lowest level of input in any financial instrument determines its level within the value hierarchy. In October 2008, the Financial Accounting Standards Board (FASB) issued FAS 157-3, approving the use of management estimates or assumptions to determine fair value in not active markets. In April 2009 this rule was amended to FAS 157-4 and applied fair value assumptions to not orderly transactions of assets and liabilities with significantly decreased activities. These new FASB rules have tremendously helped financial firms to hide potential losses of mostly impaired mortgage backed securities under level two and three of fair value accounting. For Goldman Sachs trading assets at fair value increased to $355.2 billion in 2Q09 from $338.3 billion in 2Q08. Composition of assets held at fair value has changed and Goldman has replaced risky collateralized debt obligations with safer US government agency debt during the most recent quarters. Though the firm has not at all shied away from derivative contracts and as of June 2009 held a net position of $90.0 billion at fair value. Although compression efforts across the industry have helped to decrease the notional amount of derivative contracts outstanding, the firm’s gross fair value exposure was still a staggering $1.093 trillion. Purchased $3.19 trillion of credit derivatives were partially offset with $2.96 trillion in written contracts. Net of collateral only $90.0 billion contributed to trading assets at fair value. Net purchased protection total derivative exposure was $227.02 billion as of June 2009, with $212.1 billion level 2 and $15.0 billion level 3. A $137.5 billion cash collateral helped to reduce the risks associated with these derivative contracts. At the end of the fist quarter 2007 cash collateral for derivative contracts at fair value was a meager $27.7 billion, representative of an easygoing and low risk culture on Wall Street at the time. For the first time the financial statement provided some insight into the composition of the firms staggering exposure to derivative contracts. In the second quarter 2009 the firm held a gross exposure of written high risk credit derivatives with credit spreads of 501 to 1000 basis points or greater over Libor. $73.3 billion had a term exposure of 5 years or greater and a total of $526.9 billion a term exposure of zero to five years or greater. These contracts were partially offset with purchased credit derivatives and their fair value was also greatly reduced. Nevertheless it poses a staggering exposure to potentially toxic assets in a harmful environment of severe credit contraction. From trading assets held at fair value at the end of the second quarter $332.7 billion were still level 2 and $54.4 billion, with economic exposure of actually $50.3 billion, at level 3. In the first quarter of 2007 Goldman owned financial assets at fair value of $231.6 billion at level 2 and $47.6 billion at level 3. Fair value of level 2 and 3 assets as determined by FASB 157-3,4 are subject to the firm’s estimates and assumptions and not mark-to-market. Probably the most contentious issue with the business of accounting in financial firms has been and still is the issue of securitization activities. 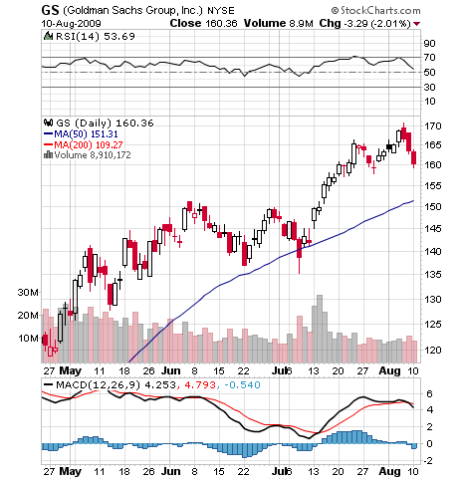 Goldman Sachs securitizes commercial and residential mortgages and other financial assets. This has undoubtedly been the driving force of a debt fueled economy in the past, but will it remain so in the future? The latest data reveal securitization has virtually come to a standstill, and this shutdown of the consumer is behind rather tepid assertions of economic recovery. 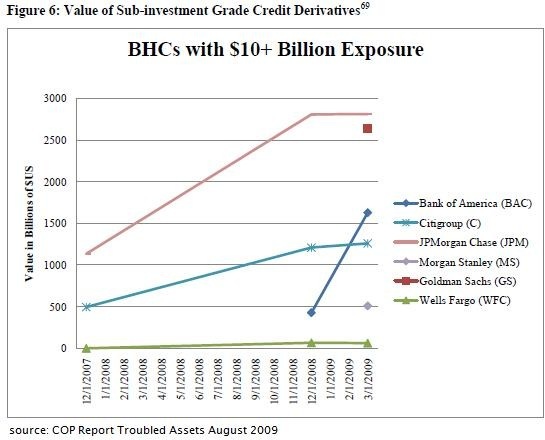 During the three months ending June 2009 Goldman only sold $12.9 billion in securitized products, of which $12.4 billion were primarily safe government agency securitizations and only $496 million of other financial assets. In the first quarter 2007, $16.8 billion in residential mortgage securitizations and $14.8 billion in other securitizations, primarily collateral debt obligations, were transacted. Total shareholder’ equity was $62.8 billion at the end of the quarter. As of June 2009 the firms equity was about fourteen times leveraged to hold total assets of $889.5 billion. During the first quarter of 2007 shareholder’ equity was still 25 times leveraged. This apparent reduction of leverage in the current quarter is not attributable to general deleveraging. Shareholder’ equity has benefitted greatly from increase in retained earnings and additional paid-in capital. There were some positive developments as well during the most recent quarter. At the end of the first quarter of 2007 financial assets at fair value subtracted $36.9 billion from cash flows from operating activities. That has dramatically changed in the most recent quarter and trading assets at fair value attributed $172.3 billion to cash flow. This form of associated cash flow from the sale of non-current assets is added back onto the income statement and helps to improve the firm’s earnings. Overall Goldman Sachs’ balance sheet has improved but is nowhere close to the optimism infused during its earnings report. Fair value accounting with level 2 and 3 still unreasonable high pose tremendous risk. Securitization activities, fuel to a consumer driven economy, ceased to exist. Yet financial firms and other Wall Street combat optimists are again celebrating. The debate over reigning in the financial industry’s notorious ingenuity and lavish executive compensation is ongoing, all the while bankers are still celebrating. A conflict of interest in this mission impossible to control Wall Street is a done deal with no recourse to moderation. Public outrage is therefore understandable and some are even beginning to ask the question: Do We Need Goldman Sachs? Bloated and vague balance sheets of Goldman Sachs and others are testament to a culture on Wall Street hostile to a broad base of a public investment community. They want their game to be elitist and government and regulators have supported them in the past and will continue to do so also in the foreseeable future. Though we must fear that change is nothing but lip service.